What scares you may not scare me since we are different. However, there are these horror movies that are being produced every day. Maybe you may have come across many of these movies while quickly looking through your Netflix account or while choosing one from a local collection. Well, you might not know every one of them and not all of the ones you know that scared you equally. Nevertheless, sincerely speaking, some horror movies are more terrifying and enjoyable than others and as such, generate much money for the producers. John Landis, who also made “AND Animal House”, was very diverse for bringing to us a supernatural atmosphere. For sure, the atmosphere not only brought us an on-screen terror, but also an off-screen one that left one buried in his own imagination. David Naughton produces very compelling likeability, and he should be commended for that, as the one who is greatly afflicted here yet he changes into a gruesome monster that scares and assails people. 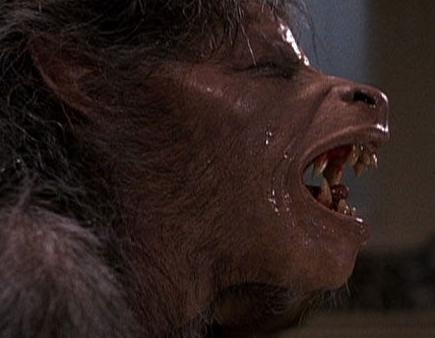 The famous Rick Baker produces a makeup effect that up to date is yet to be matched. The most scaring scenes/moments in the film include the main character’s dead friend talking to him repeatedly which was quite terrifying. But the most conspicuous scene that one can’t be able to rub off the mind is when the leading character, David Kessler, transforms into a wolf. Rick Baker manages to create scenes that hold their relevance up to today. These scenes compel one to watch the movie again and again, with no film up to today managing to create equivalent scenes. 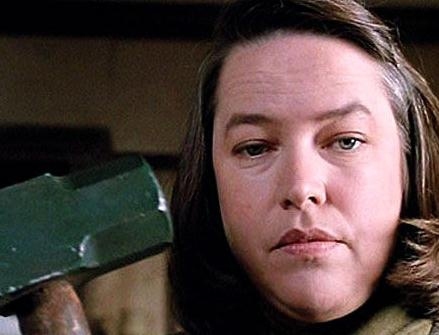 Kathy Bates’ Annie Wilkes does well in creating a horrific scene in this film, a terrifying female horror ever. Initially she was naturally caring, loving and helpful-name them. This can be traced back to her nursing profession. You know how human these people are, treating you with all those ugly wounds, helping screaming accident survivors, and remember helping the delivering mums, very kind indeed. Despite all those good traits mentioned, she was mad with James Canaan’s novelist by the name Paul Sheldon. She unfortunately seduced Sheldon in her secluded home where she forced him to rewrite the novel because of killing her best character. With the help of Bates Annie, Screenwriter William Goldman and director Rob Reiner drew everything needed to completely make the film a chill to watch. Annie creates the most scaring scene when she puts a piece of wood between Paul’s ankles and proceeds to take a hammer to break them sideways. This even made her win the Oscar Award. King describes in his book that Annie used an axe instead of a hammer it is horrific is based on how King describes it. However, what we see on the screen proves to be more terrifying. Judging the movie from the plot, it may fall under the category of the million zombie movie that you have watched. However, on deeper examination of the movie, the characters are not really zombies unless one wants to make petty conclusions. The movie has a series of effective jumps that are done with many skills and really get into your nerves, and you are still left imagining how they did them a long time after watching the movie. The lead actor does an enthralling performance that is really convincing. The movie has a good number of scaring moments. Include are when the firemen falls halfway the stairs and when an infected little young girl bites someone from nowhere. The most scaring scene happens in the last minutes when the lights are switched off, and the night camera takes charge. Next, is you being left wondering what is actually happening to the remaining uninfected people in the room, and if it were you? A hard question to answer but the imagination itself is a real horror. Recent movies have tried to create the same effects, using night horror effects, with none matching the one in [REC]. Composed by Stanley Kubrick, The Shining is undoubtedly the most horrid movie even in this list. It has haunting and terrifying features which are iconic in making a movie a true horror. Moments like Steadicam floating trough the hallways in the rooms of The Overlook Hotel, to the weird and frightening scenes give The Shining the true qualities of horror film which is no match. 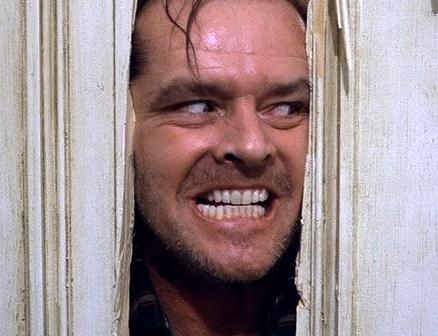 Jack Nicholson’s best role creates an extraordinary chilly performance which leaves Jack Torrance, Wendy and her husband Shelly Duvall completely terrified, and the junior Danny a survivor of a horror. These scenes bring the scary moments: The blood flowing blood from the elevator, beautiful woman abruptly becoming old, and Danny being followed by Jack in the snow maze. Those maybe are just too lenient happenings in the movie. The greatest horrific scene in this movie and maybe in others that will come is when Jack hack his way via the bathroom with an axe. Wendyon the other side is terrified and she isjust aknife to shield her from the chop of the axe that Jack is holding, and as Jack nears, more frightening it becomes as one wonder what will happen to Wendy. As Jack breaks the door and his face appears and ‘Heeeeeeerrrees Johnny!” comes out of his mouth, the horror climaxes. The movie set off on a sad note since our main character’s husband and daughter dies terribly. It is a movie dominated by female casts and a male appeared once in few minutes. The scariness of the movie starts to dawn in the start of the movie where only what is visible is endless caves full of darkness with lurking shadows which no one seems to know they indicate what. That gives the movie a good start of horror for it prepares you for the real rival appears. 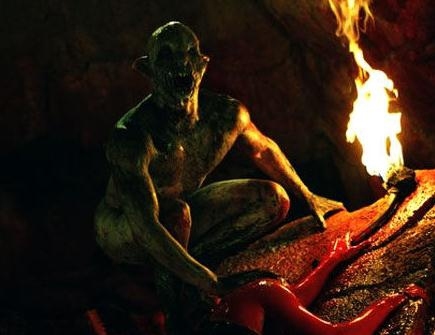 Some of the scaring scenes are like when Sarah got trapped when she was in the passageway between two caves and it (passageway) starts to collapse and during the night when the crawlers are feeding. However, the moment that makes this movie a real scare is when women in a group come at an open space in the cave crossed by many paths leading to all areas in the caves. A Crawler out of nowhere glares over one woman. Guess what results, the women fall on a blood-spattered, chaotic and wild attack from the crawlers where some manage to rescue themselves whereas others fall on the spot, a truly terrifying happening that can give you nightmares.